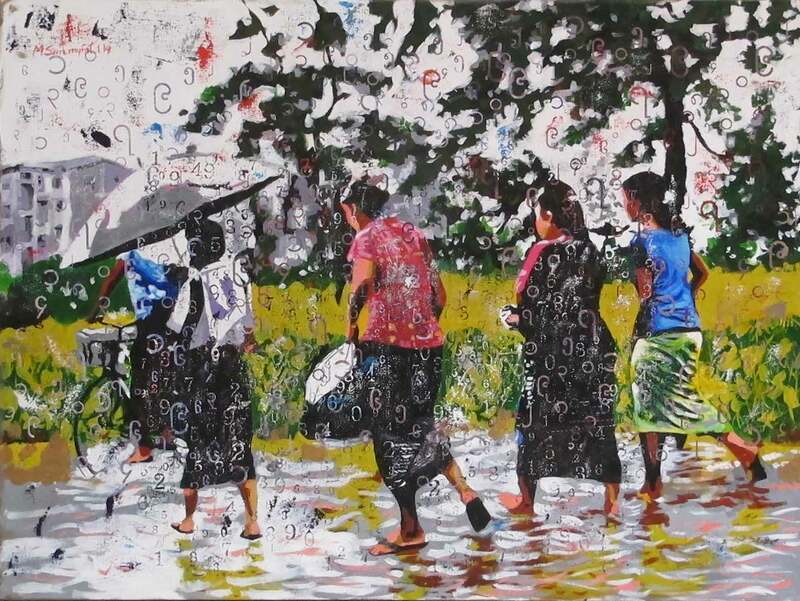 M(yint) San Myint finished his art studies during the 1980s. Since about ten years, he uses a very special technique as a base of most of his works – silk-screening, completed by topics usually taken from everyday life. The motives laid on the canvas with the help of silk-screening technique usually repeat the main topic of the work – hence emphasizing its presence and its message. However, the painter often chooses to multiply some elements completely differing of the rest of the composition like in his `Number` series. A rainy day… some were lucky to bring their umbrella. With shoes or without, men and women are walking in one direction, showing their back to the spectator. Behind the flooded road, thick vegetation arises – behind the various shades of green, grey house blocks appear in the background. Silence, fatigue can be felt through the brushstrokes, yet the painting is far from being sad. It is just every days. After a shorter contemplation, the heavy raindrops filling the surface turn out to be numbers. Floating throughout the whole entity of the painting, they weigh more than it would appear at first sight. Like thoughts spreading in the air, numbers are there to remind one of the main concerns of our every days. So simple, still so difficult to avoid them. Numbers for salary, for food. Numbers for family members, electricity bill, days of the months – but also to translate some values. They seem to be patterns, infiltrating in the entity of the composition. Can all the values be converted into money?